Many thanks for all of your kind words on the birth of our Baby Noah. We’ve been cherishing our family time together and are happy to report we have a very healthy, happy and alert little boy! At his one month check-up Noah weighed 10 pounds 12 ounces (up 1 pound 6 ounces from birth) and had grown half an inch, measuring 21.5 inches long. He’s proving to be a great little grower! Fortunately nursing came pretty easy to both of us, though we did meet with a lactation consultant early on to address some minor hiccups–no pun intended. Fortunately for us, he seemed to understand the difference between day and night from the get-go and by some small miracle we’ve really only had a few long, fussy nights so far. Noah’s even started to give us some pretty long stretches of sleep at night, sometimes 5+ hours at a time. Last night he only woke us up one time to nurse–another first to celebrate! My first six weeks of motherhood have been nothing short of amazing, albeit overwhelmingly emotional. 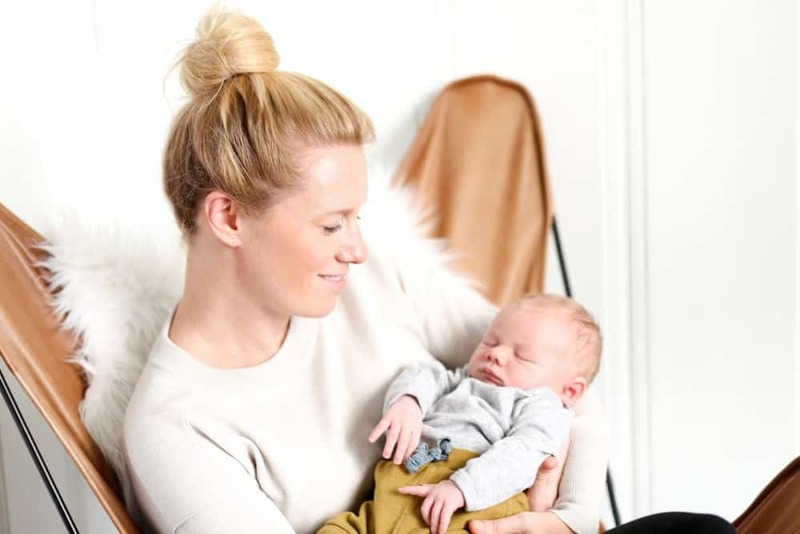 I was not someone who always knew they wanted to become a mother so the fact that I’ve fallen in love with being a mom so quickly and taken to it with relative ease has been a very welcome surprise. Thankfully my doctor warned me about the spike in progesterone that happens after birth and the emotional roller coaster that ensues, because no one else ever did! I’m thankful for those emotions though because never before has my heart felt so full. Needless to say I cried a lot in the early weeks, partly out of joy, love and sheer exhaustion, but mostly out of relief: relief for having a healthy baby, an uncomplicated delivery, and to finally be holding our little boy after nearly 10 months of waiting. Hubs and I know we lucked out with little Noah but adjusting to my new role as a mom hasn’t come without some challenges. The two things I’ve struggled with most since giving birth have been coping with the physical recovery from those 12 grueling hours and adjusting to the new, around-the-clock responsibility I now have for this tiny human. Noah was a big boy and getting him out was by far the hardest thing I’ve ever done. Whoever says giving birth is like running a marathon is straight up lying to your face. Giving birth is arguably the most traumatic event a body can go through, there’s even research to prove it. I’m just wondering why nobody ever tells you this before you get pregnant! Running an ultra marathon uphill, backwards, barefoot (naked, actually) through two feet of snow would still be easier in my opinion. Before having Noah, I was under the impression that I’d be ready to start running again after those initial 4-6 weeks of recovery. After all, that is when doctors tell you you can “resume exercising”, right? Wow was I misinformed. Needless to say the recovery process has been slow–much slower than I ever anticipated. This might be TMI but, up until a couple of weeks ago, it honestly felt like I had been hit with a baseball bat a thousand times down there. Strolling to Starbucks for a decaf latte felt like an olympic event. Lately I’ve managed to get out for a couple of short hikes with the boys but these days my workouts mostly consist of leisurely walking and gentle yoga–not quite the intense, endorphin-releasing activities my body has come to crave. As someone who loves nothing more than a tough workout to relieve stress, not being able to exercise at the level and intensity I’m used to has definitely made it tougher to cope with the challenges of being a new mom some days, especially since we’re sleeping decently well and I actually have energy to exercise. I know this will improve with time but wish I could just get on with it already! The other big challenge I’ve come to face is the continuous obligation I have to little Noah. Being the kid’s sole food source not only makes it tough to get anything done but turns even the slightest errand a major event. My day literally revolves around when Noah ate last and when he’ll need to eat again. Whereas I used to mentally map out my entire day the night before (i.e. workout/shower 7-9AM, work 9-5PM, commute/run errands 5-7PM, dinner/relax 7:30-10PM), I now operate in 2 hour increments and consider the day a success if I scratch even one thing off my to-do list before falling into bed each night. Some days I have all I can do just to empty the dishwasher or throw a load of laundry in between feedings. I have hundreds of emails in my inbox that need replies, a dozen or so phone calls I’ve yet to return and sat down no less than ten times to write this blog post. The hubs actually took the little man to an art museum yesterday (yes, we’re starting him young!) so I could finish it. Things are starting to get a bit easier, though. After trying a couple of different bottles, Noah has made slow but sure progress with bottle feedings recently which means I get a little bit more freedom on occasion. It’s not a lot of time but, when the hubs can cover a feeding now and then, I’m able to step out of the “mom” role to go to yoga, do some writing, or even sip a glass of wine (ok, two) after dinner some nights. So, the adventure continues. As demanding and overwhelming as being a new mom can be, it has been more amazing, rewarding, and come more naturally to me than I ever expected, which is all I could ever ask for. Congratulations on Noah! He is so close to Olivia’s birthday. She was December 2. It was funny reading this, because it was so much like what I would have written. Being a mom is so tough, but so worth it. Referring back to the comment you left on my post, I hope we both get some sleep soon. What a great post. Thank you so much for sharing! It is so hard in the beginning but the best part is that each day it gets easier bit by bit. How wonderful you have a good sleeper… it makes such a difference. Would love to hear a recap of Noah’s birth. I found this hugely therapeutic to write, even though I don’t have a blog to publish it on, just sharing it with friends allowed me to process the whole experience and I”m so glad to have it to look back on. Enjoy all the fun moments and milestones to come! Congrats on the new addition to your family! He looks adorable. What an exciting year it’s going to be. I think I feel the same way as you do about the challenges, but I’m glad it’s getting easier for you. At least it sounds like he’s going to be an easy baby as far as sleep! Ohhh maaaaan! I remember it so well. I thought I would “bounce back” and I be running at 6 weeks, but it took me 8, and that was still sore. I just ran my first marathon post-baby (13 months), so you will get there! Definitely have some different niggles through training, but ease back in and you will be fine. Congrats!! Congrats on baby Noah!! He’s a cutie!!! Congratulations!! Motherhood really is rewarding (Although very demanding). He’s beautiful, I love reading about other parents experiences. I’m currently expecting my second, and although I was also lucky that my first was so placid, I’m still nervous about how my second will be. Things will smooth out soon once you’ve got a hang on what does and doesn’t work for your little Noah! If you find a spare few minutes (I know how hard that can be) I would love it if you checked my blog out! I’m pretty new to blogging. Thank you for being so candid. It’s honestly refreshing to hear. We are due with our first child in May, and I’ve really been struggling with pregnancy itself. I too haven’t always wanted children, so it’s a nice thing to hear it’s easy to fall in love with… Not that I necessarily anticipated anything different. I hope you and your family enjoy your week away! Congrats to baby Noah :-) Happy new year! So beautiful and honest, great post. Although I can’t relate to being a mom or understand what you’re going through, I’m so proud of you! I’ve never been a “I have to have kids person” but hearing about Noah through this whole process has been inspirational! You are doing amazing mama! The 4th trimester is so real but I feel like things start clicking after six weeks. Hang in there! What an honest account of what those first weeks are like–they are a roller coaster of emotions, and the highs are very high, and the lows can be very low! I can imagine that a difficult physical recovery would make that even more intense. Having a baby brings such immense, chest-crushing joy–but it can also be overwhelming. I’m tempted to say “let the emails wait, go easy on yourself” but I know that’s easier said than done! And I know it’s hard when you want to get back to some of things you did before–like exercising and being productive with work–but yet you know you have to dig in and be patient. Know that you’re not alone and that you’re now part of an incredible support system known as fellow moms. :) Wishing you well! Hang in there! It does get easier. At six weeks I felt like things had clicked, but looking back they really did not click until 10 weeks. Even now though things change every day. Ah, motherhood! I really enjoyed your honest take on becoming a mom for the first time. At 20 weeks pregnant with our first child, your post has provided great perspective on how the recovery process is slower than we might hope or expect. Thanks for sharing and congrats on baby Noah!